Business travel is hard — hard on the body, hard on the mind — but making a few intelligent choices can make all the difference in terms of efficiency. To paraphrase the old saying about charity, “Good health starts at home.” You can’t be your best if you don’t take care of yourself first. Here are five strategies to help you be the most efficient traveler possible. 1. Pack wisely. Choosing the best luggage to meet your needs is the first way to set yourself up for success and streamline your travel experience. Our Crew™ 11 20″ Business Plus Carry-on is not only lightweight and durable, it features a complete business organizer with RFID protection for easy accessibility to your essentials and protection from identity theft. The Crew™ Executive Choice™ 2 checkpoint-friendly backpack is designed to maximize functional efficiency while on the road. 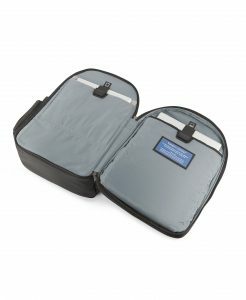 Its exterior USB port and dedicated Power Bank battery pocket ensure you always have access to power on the move (battery not included), and the built-in business organizer has unique storage amenities, including padded and quilted sleeves for both a standard size laptop and tablet. Ensure all your essentials get where you’re going to and maximize efficiency while you’re doing it with a single bag. 2. Speaking of getting where you’re going, consider different modes of transportation. There are different, sometimes hidden advantages and disadvantages to various forms of travel, such as productivity en route. Weigh flying versus driving versus train travel to see which one gives you the best combination of productivity, less time wasted, and value for the dollar. 3. Be equally selective about your accommodations. Yes, the hotel further away from the customer is less expensive, but if you have to pay an Uber driver the difference to get there and back, the savings is a wash. Take the time to shop your options after you’ve thought through your needs for the location. 4. Fly once, visit many. It’s inefficient to spend the time and money to travel to a city where you have multiple existing or potential clients and not make time to see all of them. Take advantage of your proximity to schedule face to face meetings. Even if it costs you an extra night or two in a hotel, the lodging is usually cheaper than additional airfare. 5. Finally, create a detailed agenda. Those who fail to plan plan to fail, and that’s not you! Planning an itinerary not only allows you to schedule yourself effectively, it helps you articulate your thoughts and prioritize your goals. And, it even helps you figure out what clothes you need to pack, which results in wiser packing. How do you travel efficiently? Do you do anything special to get the most out of your trip and stretch your time and money? Share your ideas in the comments below, on our Facebook page, or in our Twitter stream.